View ANGELeNEWS in a web browser. Do you know someone who may be interested in our new Elementary Level - Traditional K3 program, the new Catherine & Bob Hilliard Montessori Building, or our several college preparatory programs beginning at the Middle Level? 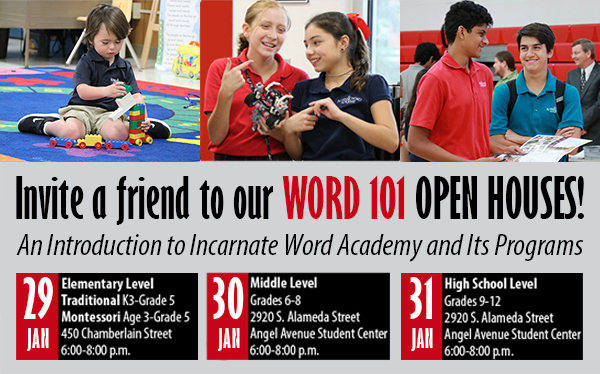 If so, now is the time to spread the WORD about our WORD 101 Open House events! With our open houses just around the corner, we need your help letting everybody know exactly what IWA has to offer. This event is intended for prospective families who may be interested in finding out more about the IWA experience and families with students transitioning to the next school level. We encourage you to invite friends or family to RSVP and join us during one of our WORD 101 events! For more information, visit iwacc.org/WORD101. January 29th | 6:00-8:00 p.m.
January 30th | 6:00-8:00 p.m.
January 31st | 6:00-8:00 p.m. In Celebration of the Feast of Our Lady of Guadalupe, Angels gathered in the Mother Patricia Gunning Gymnasium for a campus-wide Mass on December 12th. Angels sang alongside the group Mariachi Mexicanisimio and presented flowers in honor of our Blessed Virgin Mary. Our Elementary Level Choir sang beautiful renditions of well-known Christmas carols as they visited several local nursing homes on December 14th. 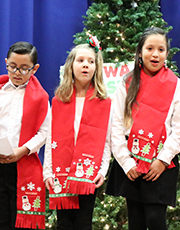 Accompanied by choir director Lazaro Rocha, little Angels sang beautiful renditions of "Jingle Bells," "Silent Night," "Away in a Manger," and many more. The students ending their field trip by caroling at the Convent of the Sisters of the Incarnate Word and Blessed Sacrament, who lovingly welcomed Angels to dine with them for lunch and into their chapel for prayer. Middle Level students in Mrs. Damian's Speech and Current Events classes spent the week prior to their exams studying in her football themed classroom. 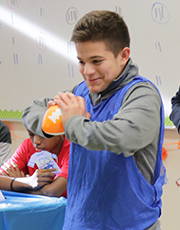 Angels prepared by engaging in daily content-centered mini games and earned points based on academic performance, sportsmanship, and teamwork. The transformation of the classroom helps provide our students with a new and stimulating environment that supports quality learning. For over 25 years, IWA has been blessed to work with Child Protective Services in providing gifts and donations to families in celebration of the Advent Season. This year was no different as Religious Studies classes collected over 150 presents to provide kids with some extra holiday cheer. 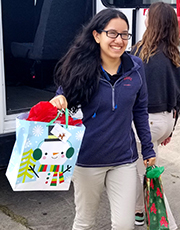 High School Level seniors arrived at CPS on two buses to hand deliver the gifts on December 11th. 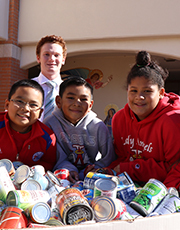 Students, families, faculty, and staff within the IWA community collected an astounding 2,827 pounds of nonperishable food items for our annual Christmas Food Drive on December 14th. A collaborative effort from our student council members at all school levels, the donations will help feed families throughout the 11 counties served by the Coastal Bend Food Bank. Little Angels traveled back in time to find the true meaning of Christmas during the Elementary Level's performance of "Back to the Manger" on December 19th in the Mother Patricia Gunning Gymnasium. 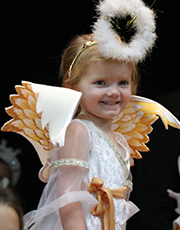 Play attendees filled the gym with laughter, smiles and applause as little Angels performed their hearts out and divulged the true meaning of Christmas spirit. 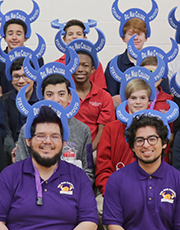 Representatives from Del Mar College's Viking Fellas club visited with Middle Level eighth-graders on December 13th. 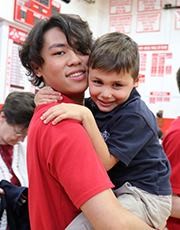 The visiting Vikings discussed with our Angels several important aspects of college life such as time management, seizing as many dual enrollment credits as possible once they transition to the High School Level, and fully utilizing all of the preparatory opportunities available at IWA. Eighth-graders left the college visit not only with a piece of mind for their futures, but also some Del Mar swag in the form of foam Viking horns! 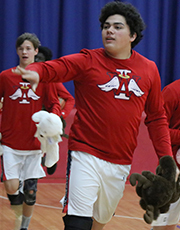 It rained cats and dogs — and bears, bunnies, and other soft creatures — during the varsity boys basketball team's third annual Toy Toss game on December 14th. The team netted hundreds of stuffed toys for Corpus Christi's local Ronald McDonald House and Toys for Tots. Attendees brought new, soft toys in lieu of admission to the game. When the Angels scored their first points, fans tossed their soft toys onto the court. The team held a stuffed toy drive throughout the week prior to the game so those unable to attend could donate as well. Elementary Level - Montessori Primary students but on a wonderful performance during their holiday play "C-H-R-I-S-T-M-A-S Spells Christmas" on December 20th in the James R. Dougherty, Jr. Center. Parents and play attendees were awed to see their little Angels recreate the nativity and tell the story of our Lord and Savior. 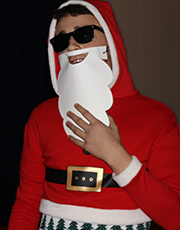 Middle Level students performed impromptu Christmas skits in front of their peers and faculty members on December 20th. Angels performed holiday classics such as "Frosty the Snowman," "Rudolph the Red Nose Reindeer," "Rockin' Around the Christmas Tree," and many more. To put an extra spin on things, eighth grade students performed a few of their favorite pop hits and inserted lyrics focused on their respective houses. 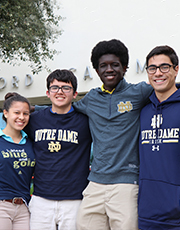 IWA seniors Joseph Afuso, Daniel Diejomaoh, Santiago Mendizabal, and Madeline Villa, who applied for early admission to the University of Notre Dame, have already been accepted! We cannot wait to see what colleges and universities our Class of 2019 decide to attend come Decision Day later this year. Congratulations, Angels! Our Elementary Level fifth-graders spread some Christmas cheer when they visited Gloria Hicks Elementary during the holidays. 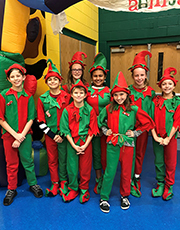 Students volunteered for the school's annual Christmas Around the World event as they helped make ornaments, delivered presents, decorated Christmas cookies, and read stories to other students. 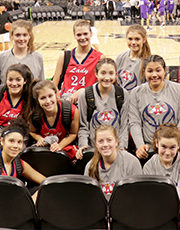 Our Lady Angels' varsity basketball team graced the court of the AT&T Center to play against San Antonio Christian on December 15th. The girls played their hearts out against the team they faced last year for the TAPPS State Championship for what was sure to be a memorable experience the Lady Angels will never forget. Afterward, the team got to see the San Antonio Spurs take on the Chicago Bulls. In case you missed it, take a look back at some of the most tender and heartfelt moments our Angels experienced this holiday season. If you would like to download the video, simply click on the link below, then click on the "Download" button at the bottom right corner of your screen.